I realize now that I never posted about my Yosemite trip. Hopefully late is better than never. This was one of the great experiences of my adult life, one good thing in 2016, and I absolutely recommend it to anyone. 2016 didn’t start out great for me. In early spring, I decided I needed a good hiking vacation to clear my head and recenter. After reviewing several options, I chose Yosemite National Park, in California’s Sierra Nevada mountains. I booked my flight to Oakland and a rental car, figuring I’d throw my backpack in and drive four hours straight into the mountains. Of note, you can’t really just up and travel to Yosemite, especially if you want to backpack overnight. The Park Service has instituted a permit requirement that requires advance reservations. This protects the environment, as well as a sense of wilderness in what might otherwise feel like a shopping mall. I first applied to begin at trailheads along Tioga Road, not realizing Tioga Road in late May was still buried in snow and closed. I was lucky, though; there was one spot still left at Happy Isles, the park’s most in-demand trailhead. I plotted a course, a 30-mile circuit that would take me over or past some of the park’s most famous landmarks. I also bought my first bear canister. Then, the week before my flight, I was called into an office and told I no longer had a job. The organization was going through changes, and my department was being eliminated. I was literally already packed, all my expenses were paid, so I didn’t cancel the trip. Hell, I thought, what better way to press the reset button on my life than four days all alone in the woods? I flew out early, hitting a small snag when a TSA agent reminded me that the matches and fire-starting supplies I had packed were not permitted, even in my checked bags. Thus commenced a 15-minute search, at the check-in counter, for the pocket where I’d stashed those supplies. The people in line behind me were not pleased. After checking each pocket 4 times, I finally gave up and decided I must have forgotten to pack them after all. If I was wrong, the agent told me, I’d arrive in Oakland to find out I had no pack and no supplies. I took a chance. 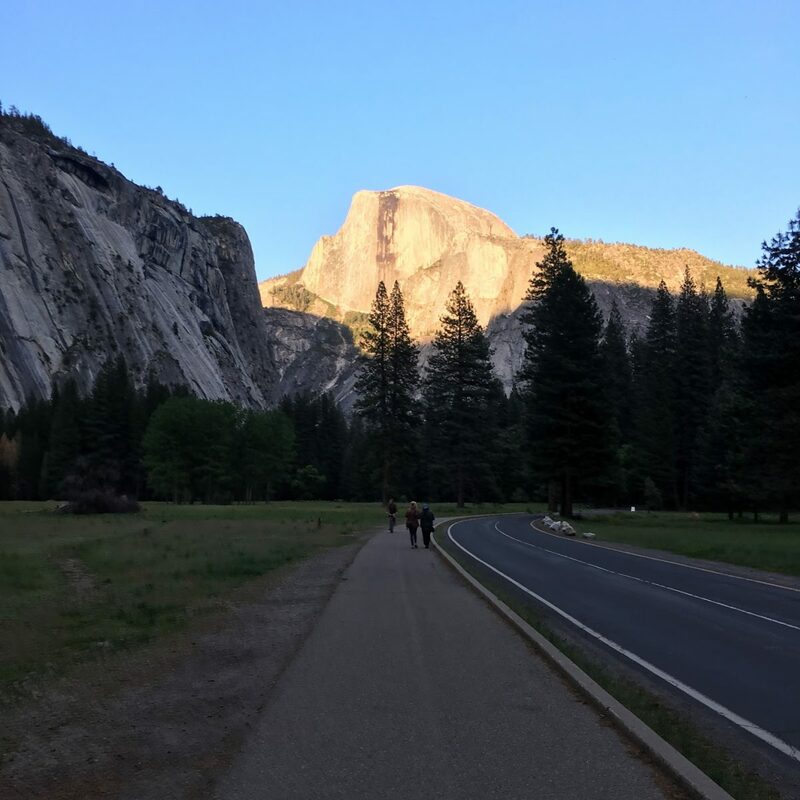 The setting sun highlights Half Dome, arguably Yosemite’s most famous attraction, seen here from a road and pedestrian path in Yosemite Valley. One day later I would sleep above the summit of the dome. I had a long wait at the baggage check, long enough to make me wonder if my bag had indeed been confiscated. But not only did it eventually turn up, it turns out my matches and firestarters were in there after all. I guess I missed a pocket. So did the TSA. My first stop, after picking up the rental car, was at In-N-Out Burger for an animal style Double-Double. When you live on the East Coast, you can’t let such an opportunity pass. My stomach thus filled, I drove 4 hours across the Central Valley and up into the mountains. This was my first visit to the Central Valley, which has a beauty all its own. Vast landscapes of rolling hills, orange groves, and roadside produce stands are a welcome change from winter in New York City. I had no idea what awaited me at 4,000 feet, however. The center of Yosemite National Park (culturally, not geographically) is Yosemite Valley, an 8-mile glacial valley. When I say that entering this valley from the western pass known as Tunnel View is breathtaking, I mean that literally. The mountains part like stage curtains, revealing the granite cliffs beyond in dramatic fashion. I have seen many wild places in my life, and nothing has ever astounded me like Yosemite. A view from my rental car, across a meadow in Yosemite Valley at Ribbon Fall. The wooden walkway at far right is there to protect the meadow ecosystem from pedestrians who want to explore it. Before bedding down, I took advantage of the flat terrain in Yosemite Valley to run a few miles. Elevation did play with my lungs a bit, but it made a great way to see more of the Valley in limited time. roads and recreational paths. Conceivably, a visitor could spend a whole visit without leaving the Valley, particularly someone who uses a wheelchair or just dislikes trail hiking. I stayed one night in a backpacker campground (a ring of tent sites, with bathrooms) before heading into the surrounding mountains. I bought some supplies at the small grocery, including my last beers for a few days. To drink Sierra Nevada in the Sierra Nevadas felt appropriate. I parked the car, set up my tent, and slept. 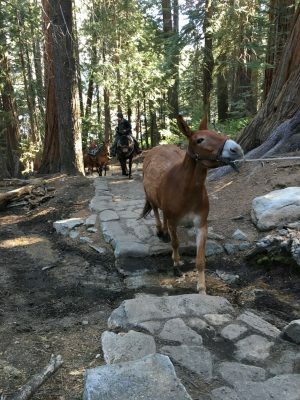 My initial plan had me following the Mist Trail into Little Yosemite Valley, past Half Dome, and over the summit of Clouds Rest, all one day one. Little Yosemite Valley is a much smaller, undeveloped valley 2,000 feet above Yosemite Valley. 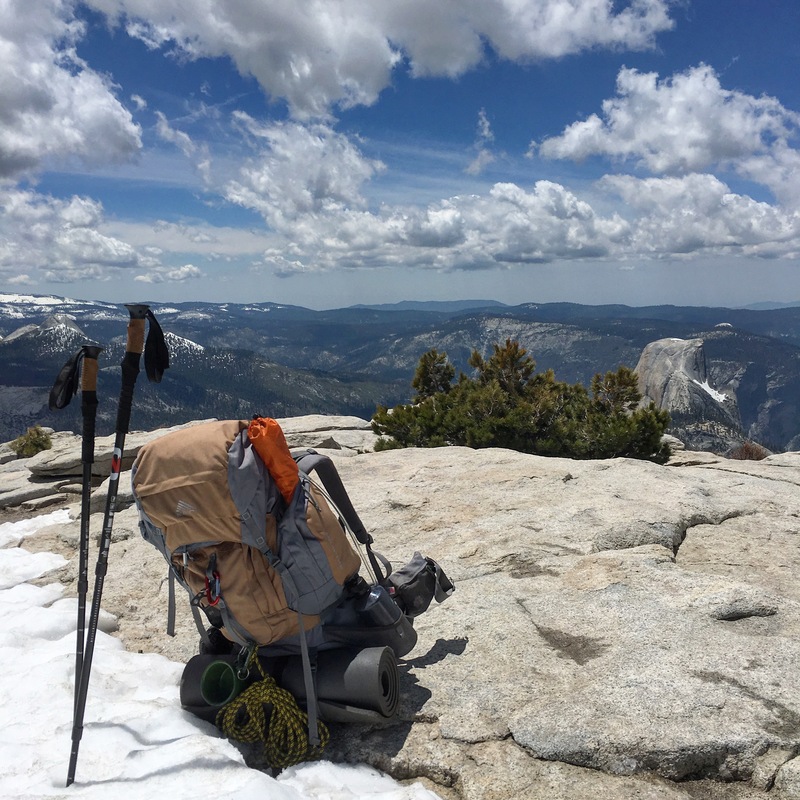 It’s a popular campsite for backpackers, especially those summiting Half Dome. 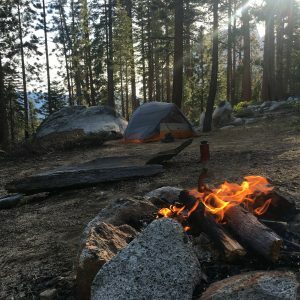 My permit, however, required me to camp beyond Little Yosemite Valley on my first night; after that, I could return and sleep there on later nights. The first really exotic animal I encountered was this coyote, early in the morning alongside one of the Yosemite Valley trails. I quickly recognized the problem with that plan. Though I’m an experienced backpacker, I’d been out of the woods for some time and lost perspective on elevation. My first-day plan took me up nearly 6,000 feet, over roughly nine miles. As I made my way up the carved staircase of slippery stone that is the Mist Trail, just a few miles in, I began to suspect my plan would change. The Mist Trail ascends beside Vernal Fall, and it’s a very popular hike. Though I was visiting before peak season, there were still many others ascending the trail, including several school field trips. The Sierras received heavy snow during the prior winter (technically, they had a normal year, but this followed years of severe drought) and the falls were very full. Many others wore yellow rain slickers; I stuck with my quick-dry trail clothes and enjoyed the clouds of cold mist on a warm, sunny day. 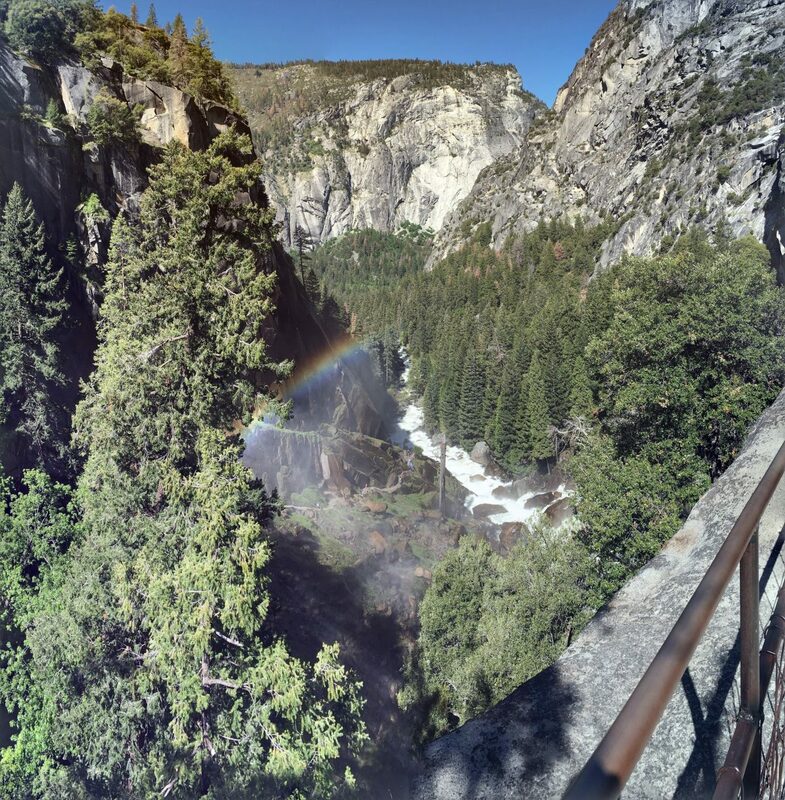 At the top of Vernal Fall, the Mist Trail gives way to a wide flat stretch. I dropped my pack and rested. Around me, school children romped and watched the falls. I found the trails in Yosemite generally well-groomed, and here a metal handrail prevented anyone from going over the falls. 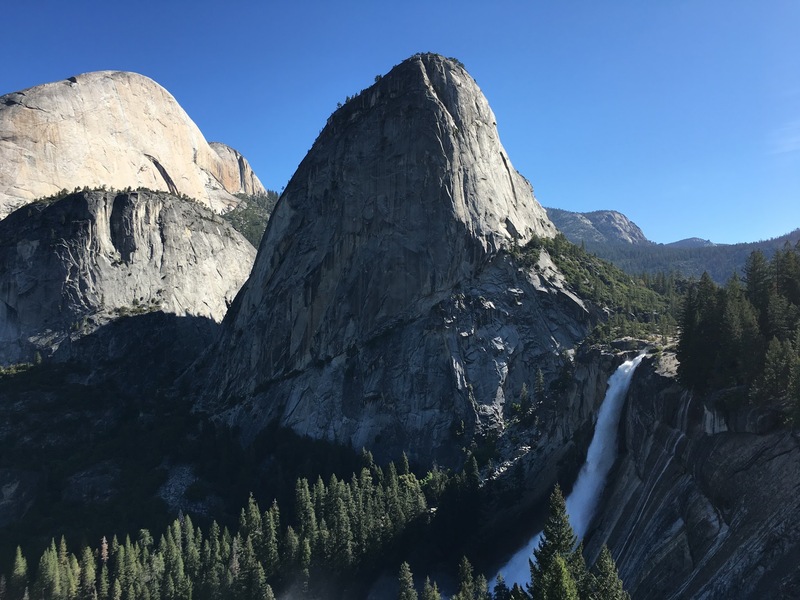 It appears the more popular and accessible trails and landmarks feature similar precautions; nevertheless, the most common fatality in Yosemite is from falls, often over a waterfall. People fail to respect heights, and especially the power even a small amount of flowing water has to push a human over. That day, the thing people failed to respect was contagion. Ground squirrels scurry around at the top of the falls, begging food from hikers. Despite warnings about plague, common in the park’s rodents, children reached out to pet the critters while chaperones watched. I left them to their pestilence and moved on. The trail from Vernal Fall to the top of Nevada Fall and the mouth of Little Yosemite Valley scrambles almost 700 feet up a near-vertical staircase of granite boulders. By this point, I knew I wouldn’t make the summit of Clouds Rest that day. I was, however, thankful I elected to use trekking poles for the first time. In the past, I had scoffed at other hikers for carrying them, but now I understood the benefit, especially as my thighs burned to move a heavy pack up another thousand feet. In hindsight, I carried too much water. You can never be sure, before setting out on a trail, how much water you’ll encounter. 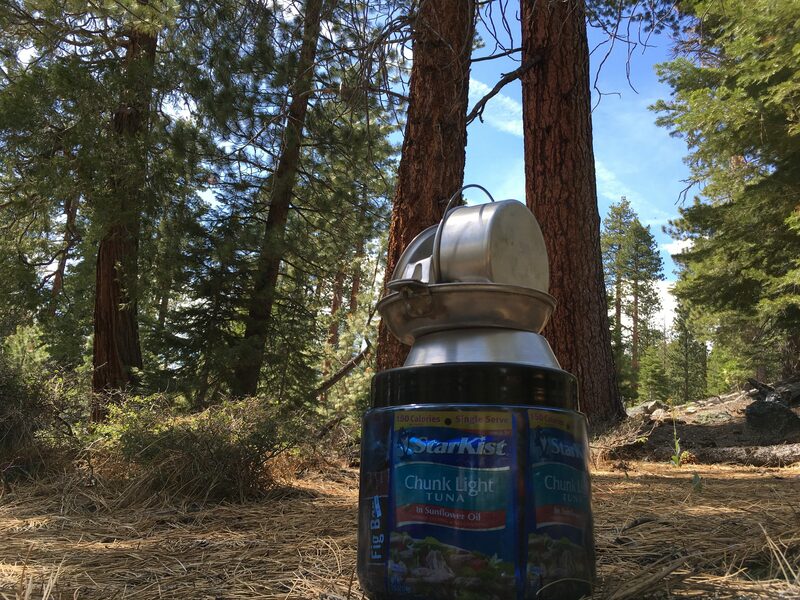 I had a quality filter, and anti-viral tablets, but to be on the safe side I’d loaded two 32-oz Nalgene bottles and a 3-liter hydration bladder inside my pack. That’s ten pounds of water, on a trail that never took me more than a mile or so from a swollen stream or river. But I didn’t know that at the start. The Merced River near Little Yosemite Valley campground, where I rinsed off and washed my clothes. I reached the flat bottom of Little Yosemite Valley, and its popular campground, thoroughly exhausted. Four miles in and 2,000 miles up from my start, my legs burned. I was drenched in sweat and smelled terrible. 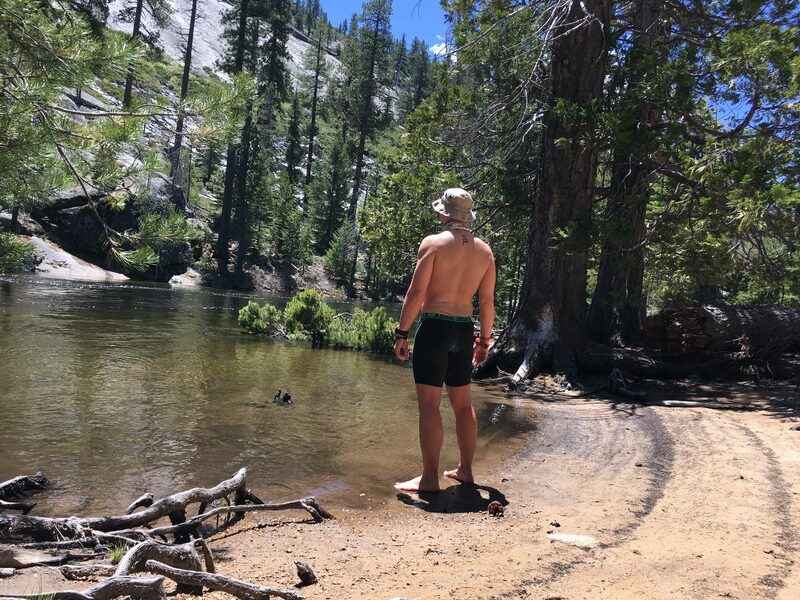 Luckily, the Merced River flows wide and slow past Little Yosemite Valley campground, which meant I could strip down and swim. When I planned my trip, the list of things I wanted to do began with skinny-dipping in a mountain stream. Here was my chance. Sorry folks, this is a family-friendly website. Shorts stay on. I first rinsed my sweat-drenched clothes in the water, which at best reached a few degrees above freezing. It had, after all, been snow probably only a few minutes before. After hanging my washed clothes over a nearby log to dry in the warm sun, I slipped off my last layer and stepped in. My feet were numb within seconds. I forced myself to stay in for maybe a minute, submerging completely and savoring the icy chill. When half my body had gone numb, it was time to climb out. In all, I spent about an hour eating and relaxing and letting my clothes dry before I resumed my climb. I knew I wasn’t going to pass the summit of Clouds Rest, but I had to pass Little Yosemite Valley before making camp. So up I went. 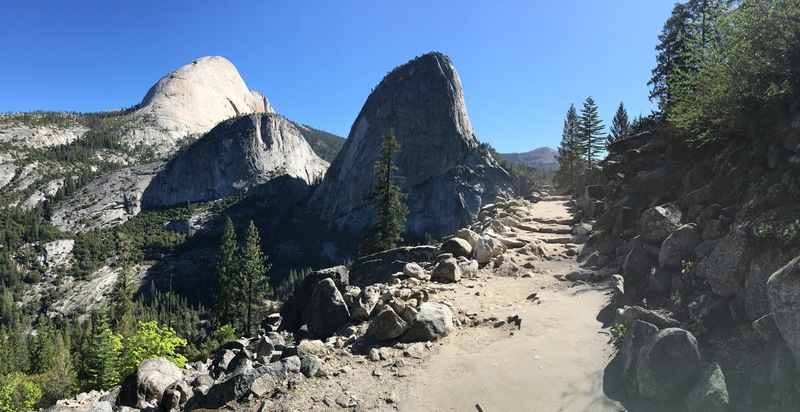 I was still on the most popular trail in Yosemite Park, because it’s the trail that leads to Half Dome. 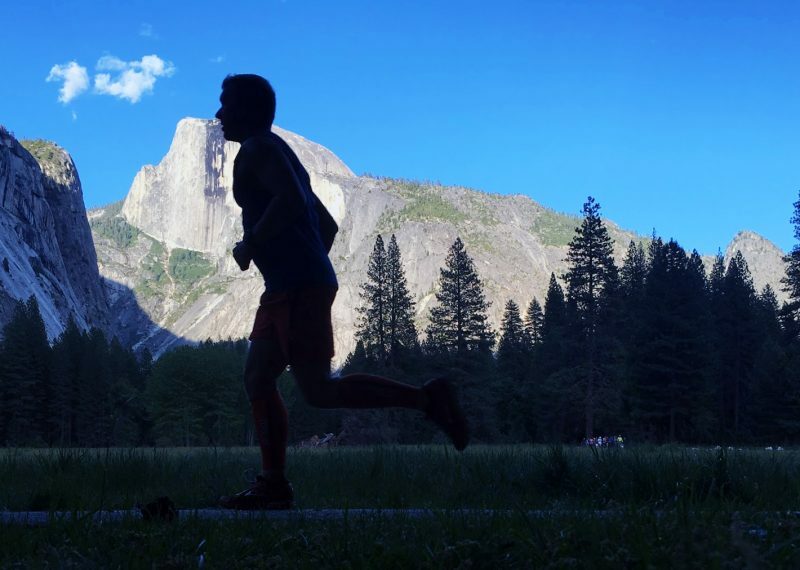 Arguably the most famous and popular attraction in the park, Half Dome is so iconic that it lends its name to REI’s most popular series of tents. Any Apple should know the iconic granite dome, so-named because it appears sawed in half. It was the default wallpaper on MacOS Yosemite. A view of Yosemite Valley from near the summit of Clouds Rest. Half Dome is just left of center. Half Dome is also famous for the steel cables permanently mounted along the final 400 feet of ascent. Owing to the steep, smooth face of the rock, climbers generally rely on those cables as handholds to reach the summit. Nevertheless, few years pass without at least one person falling to their death from the Half Dome cables. The cables are “down” in winter, meaning the series of poles that elevate them into a kind of banister are removed and stored. Even though they hang loose all winter, they remain anchored at the summit, and daredevil climbers will still use them to summit the dome. During my trip, I met at least a dozen, such climbers. 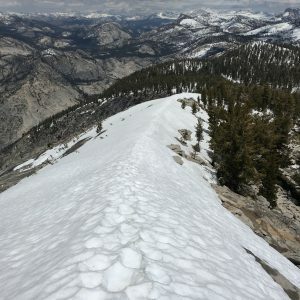 Technically it’s against the rules; the NPS requires a special permit to summit Half Dome, and does not issue them in winter. I skipped Half Dome entirely, only admiring it from a distance. My goal was the Clouds Rest, the knife-edge ridge that towers over Half Dome and everything else near Yosemite Valley. A view facing south from just below my campsite. Half Dome is at the far right. As I left the Little Valley, water was less common along the trail. At times, the Clouds Rest Trail felt downright arid, sun-baked like a Western-movie desert. I hadn’t encountered snow yet, though a trailhead ranger warned me of deep snow at elevation. On tired legs, I made it up another thousand feet, about 2.5 miles from Little Yosemite Valley. When I found a campsite within short walking distance of a flowing stream, I decided to call it a night. It was early, only about 3 in the afternoon. I had plenty of daylight left, but very little energy. I pitched camp, collected firewood, and ate dinner. I’d elected not to cook at all in the woods and eat only cold food. Cooking attracts bears, it imparts scents to your clothes that attract bears, and it requires cleaning dishes that attract bears. My first-night camp site. Note Half Dome’s silhouette visible through the trees. 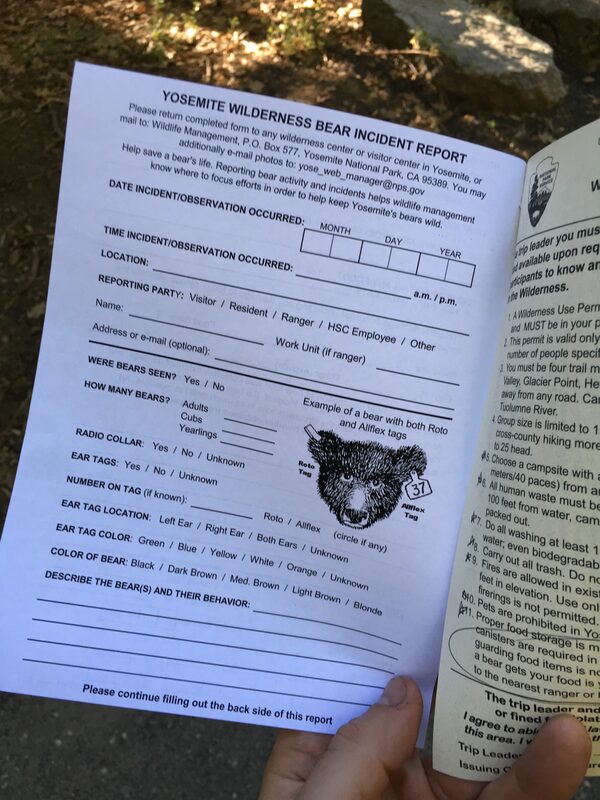 This is the “Bear Incident Report” the ranger at the welcome gave me. Note that I’m supposed to get his license plate number. Yosemite is famous for its problem bears (bears that lack fear of humans) and visitors are urged to study bear survival skills. On the good side, Yosemite’s bears are all black bears, which are relatively harmless. Unlike brown bears, they regard humans as a good source of food rather than as food themselves. Think of them like very large, very strong raccoons. They’re also relatively small. Thanks to management, few bears in Yosemite park grow larger than a big dog. My homemade alarm, in case a bear came for my food while I was asleep. I agreed, but only in hope that I’d never have to keep this promise. The ranger also told me to stack my disassembled mess kit atop my bear canister as a homemade alarm. That way if I was asleep when a bear came calling, it would wake me up. My instruction then was to run out of my tent yelling “Go away, bear!” I did as I was told, but as I lay in my sleeping bag that night, amid the stark light and deep shadow of a bright moon in the forest, I was pretty sure I would do no such thing. If my homemade alarm sounded, I wasn’t running naked from my tent and shouting in the dark. I’d remain hidden in my tent, and Midnight Bear could have anything he figured out how to obtain. I did find that my campsite, under open sky on the south slope of the mountain, received strong cell reception. Most of the park had none. Before I turned in, I briefly turned on my iPhone and registered for unemployment back in New York City. I woke a bit achy but refreshed. In truth, I suspected I had made camp too early. Had I not fully made camp as early as I did, I could have taken some rest and continued on. I resolved to correct that mistake and not quit too soon on my second day–not knowing what lay ahead. Above my camp, the landscape changed quickly. Four miles and about 3,000 feet lay between me and the summit of Clouds Rest. In between were some of the most incredible vistas I’d yet seen, as well as the first snow. Clouds Rest is not messing around. As one nears the summit, the elevation change is dramatic. The snow grew deeper, in places four to six feet, and though the surface was generally firm enough to hold my weight, in places where it thinned I would fall through. In hiking parlance this is called post-holing, and though generally annoying, it can occasionally be dangerous. The trail was also slippery, and I found myself having to kick toe-holds into the firm snow to avoid falling. I made the summit only through raw determination, resolving not to stop no matter how heavy my breathing, how hard my heart thumped, or how much my legs ached. If I stopped, I might not continue. My reward was a sight unlike anything I have ever seen. The panoramic, 360-degree view from the summit of Clouds Rest. The flag marks the end where I started; the narrowing snowy slope is my destination. Clouds Rest is a long, knife-sharp ridge that runs along the rim of Tenaya Canyon, north of Yosemite Valley. At just under ten thousand feet, it is far from the tallest peak in the Sierra Nevada–but it is by far the tallest peak in its vicinity. Standing atop that ridge, which is not much wider than a Greenwich Village sidewalk, is like standing on the spire of the Empire State Building. In every direction, 360 degrees, the world falls dramatically away from your feet. To the north, Tenaya Canyon is a fall of roughly 4,000 feet. The southern slope, slightly gentler, is only about 2,000. I spent a good hour at the summit, just admiring the view and enjoying my surroundings, before the rapid approach of dark storm clouds (the very thing that reportedly gave Clouds Rest its name) chased me away. To cross that summit, especially when accumulated snow makes it even narrower than usual, is terrifying and majestic. As I carefully made my way, the wind on my pack threatening to push me over, I watched a marmot burst out from the rocks ahead of me and sprint full-speed down the snowy slope toward certain doom. He made it look easy. Fortunately, those dark clouds spared me and no snow fell. 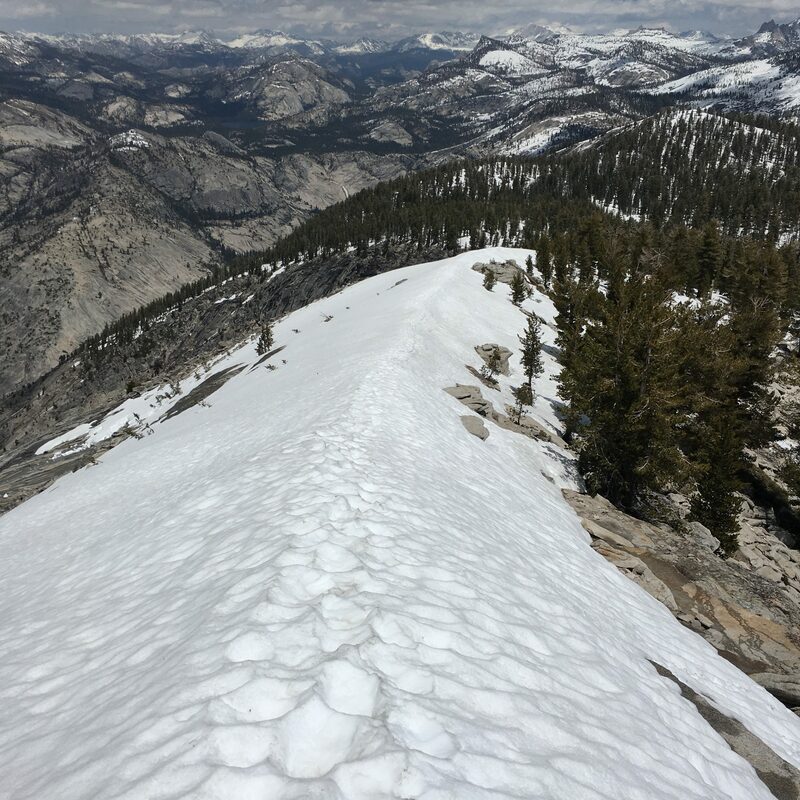 However, I had not considered that my descent from Clouds Rest followed north-facing slopes, which got less direct sun and therefore had more snow. A lot more snow. The forest here was buried beneath six to ten feet. Once again, the surface was firm enough to support my weight, even without snow-shoes, but that much snow meant the trail was invisible. On popular routes, one can usually rely on the tracks of previous hikers, but here either the sun had eradicated such tracks, or other hikers hadn’t been through. I hadn’t seen another human since I passed a group a few hundred feet below the summit, maybe 2 hours earlier. Very fortunately, I had programmed my route into my Garmin GPS watch, and though I hadn’t yet used it navigate, I could rely on it to guide me. I also had a compass, and at one point I tested to see if my old Boy Scout orienteering skills were still with me. They were not. Thank god for that GPS. After another mile or so, I passed the spot where I had originally planned to camp my first night. Not only did it now seem impossibly far, it was beneath 8 feet of snow. Not that I’m incapable of snow camping, but it wasn’t what I expected. Another turn of good luck. The snow finally gave way to solid ground after a few miles, but what I found there surprised me even more. 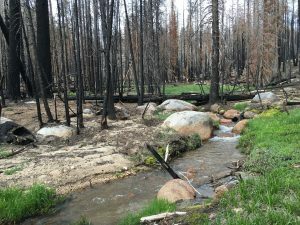 A forest fire had raged through this region recently, leaving the trees blackened and the ground absent of undergrowth Instead it was littered with soft, ashy debris, which again completely obscured the trail. In a wrinkle, I hadn’t programmed this path into my GPS because I’d made a change in route, turning south to return to Little Yosemite Valley instead of north toward Tenaya Lake. Fortunately, though I did not have cell reception, I had thought in advance to download the region to Google Maps, and even with my phone in airplane mode to conserve a depleted battery, it was able to guide me. In all, I spent five to seven hours navigating with no trail, never encountering another human. This was the point at which I felt most concerned about a bear encounter. I hadn’t passed any yet, but in the deep snow descending Clouds Rest I had seen a set of prints, fresh enough that the sun hadn’t yet melted them smooth. One set was large, and running beside it were several smaller sets. A mother bear is the most dangerous bear in the woods, and the one bear in Yosemite that is more likely to attack a human than to flee. I did not encounter any bears, however. 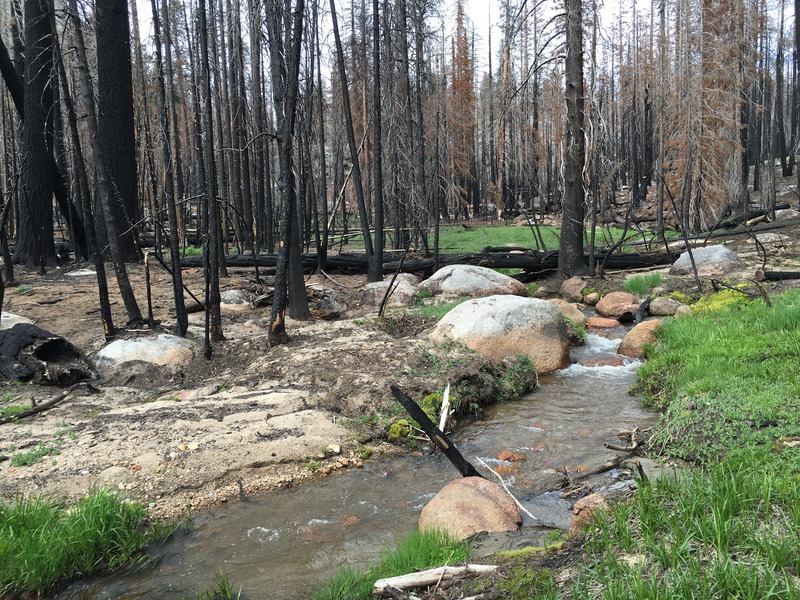 I saw a few deer, which bolted at my approach, but that burned forest was otherwise empty. It made for an eerie setting, the blackened skeletons of trees and the soft, empty earth in stark contrast with the lush and thriving forest on the southern approach. I was relieved when I found myself among greenery again, not only because it felt friendlier but also because the trail was visible once again. This was my first sight of greenery after hours hiking through snow and soot. 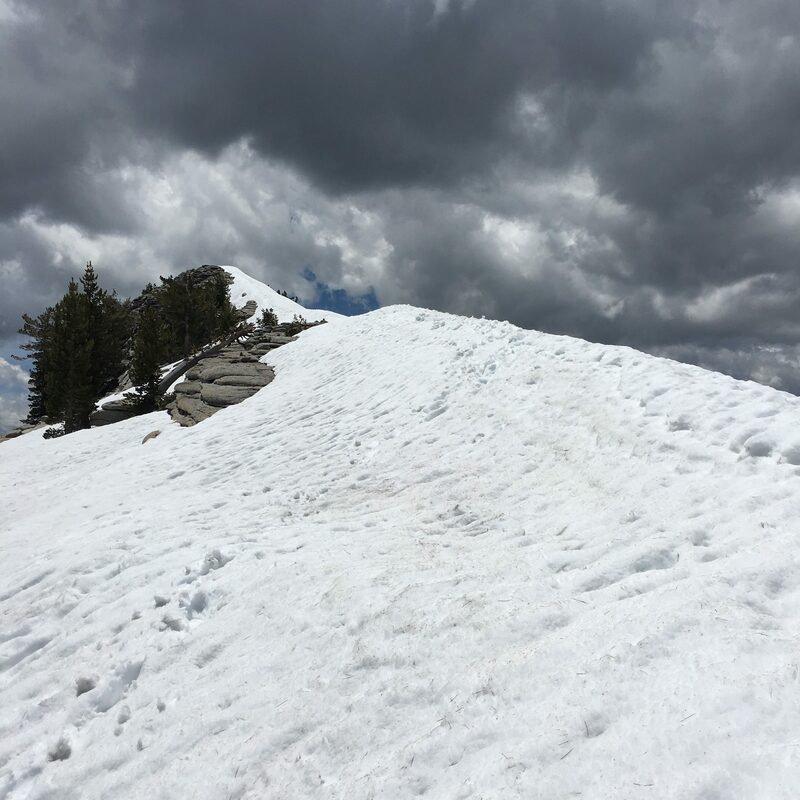 I had been on my feet for seven hours, hiked ten miles over Clouds Rest and down through deep snow. So much for my concern about quitting too Nonetheless, I wanted to reach the campground at Little Yosemite Valley. After my restless first night worried about my bear canister, I knew Little Yosemite Valley had lockers where my food would be safe and out of mind. I also knew there would be other hikers, a relief after a day of such isolation, and that my hike back to the car the next day would be relatively short. I have learned the hard way that the last mile of a hike can feel about five miles long. 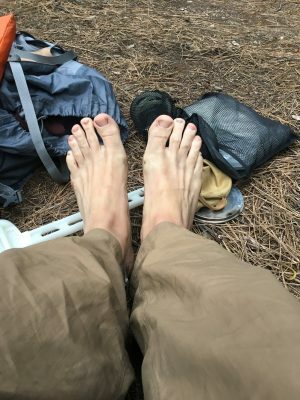 By the time I returned to Little Yosemite Valley, I had hiked more than 13 miles and been on my feet for nearly ten hours. I found a tent site, dropped my bag, and laid down on the ground. After I regained some energy, I spent a little time socializing with other backpackers around the shared camp. This was where I met the groups who summited Half Dome with the cables down. One had brought mountaineering harnesses and used the cables for their ascent. Another group went up bare-handed; they showed me their blisters. Maybe two dozen campers called the site home that night. Among them was a father of three, there with his wife and daughters. They made the trip as a birthday celebration for one of the girls, planning to spend six nights at the campsite. All were first-time campers. The tent they carried in weighed about twelve pounds. Several of us spent twenty minutes scrounging firewood from the popular-and-therefore-picked-over surroundings. At one point I stepped away to fetch something from my tent, whereupon the father of six picked up every bit of that firewood and dropped it all on the fire. 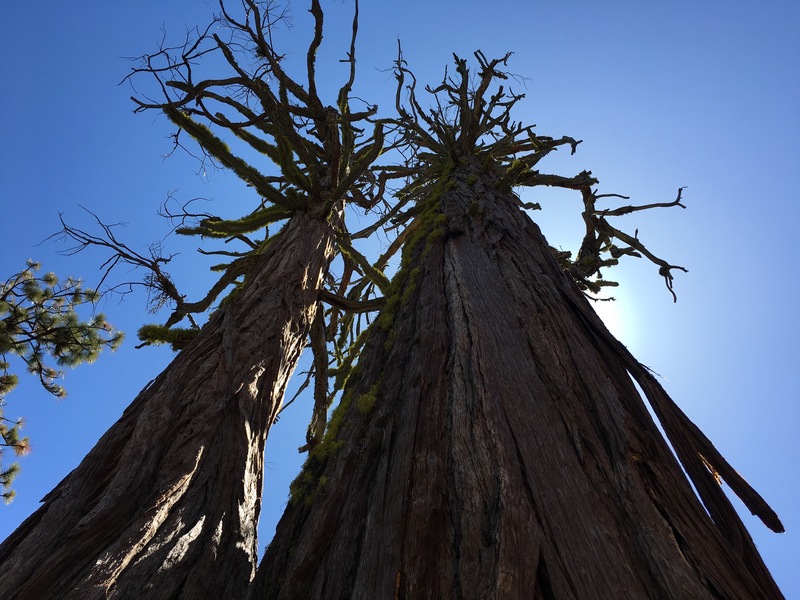 Giant Sequoia trees lend themselves to dramatic photographs. Another group came from Michigan. They hiked lugging gallon jugs of water, purchased at a local grocery store, and another twelve-pound tent. They had not, however, carried any means of purifying water. Finding their jugs emptied, they were discussing the risks in drinking unfiltered water from the Merced when I interrupted and let them borrow my filter. I slept like a rock that night. Though confident that one of these inexperienced campers would certainly bring their food to bed and attract a bear, I knew it would be visiting my tent. Word around the campfire said the forecast called for storms the next afternoon, so I broke camp early and hiked out. 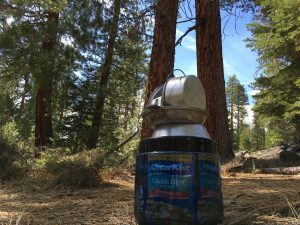 Though tired and stiff, I knew water was abundant along the trail out and so I packed light. Rather than descend the steep and crowded Mist Trail, I followed the John Muir trail across Nevada Falls and south. Here I could readily see that Yosemite was the handiwork of the Works Project Administration. Besides the railed-off vista beside Nevada Falls, the trails themselves were carefully carved out from the mountain and paved with flat fieldstones. It made for an easy hike with beautiful views of the valley. Nope. 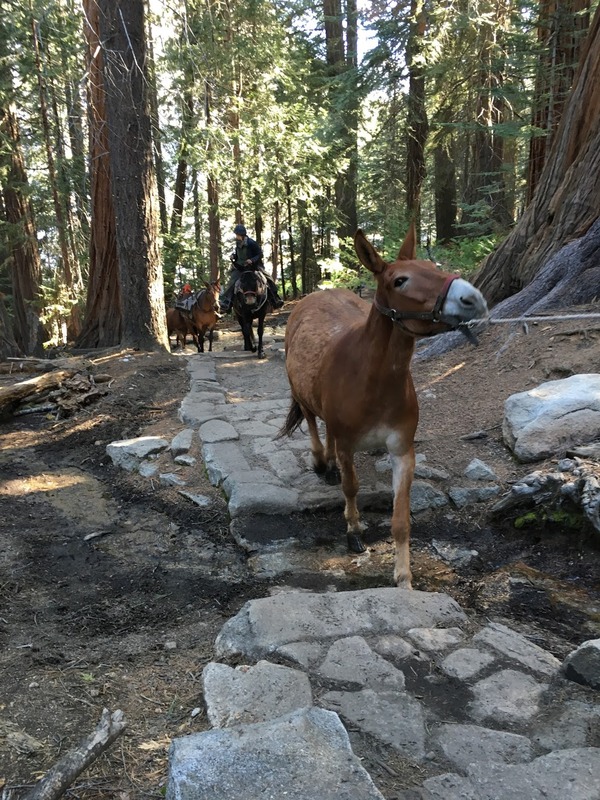 As I made my way down the Muir Trail, I encountered a train of mules and horses. Some carried rangers, others carrying supplies. A mule near the back wore a heavy pack and two chainsaws strapped to his saddle. “He drew the short straw today,” the ranger told me with a laugh. Around that time I wished I had a horse. I knew I was nearing the finish, however, my rental car just a few downhill miles ahead. By this point, I must admit, I paid less attention to my surroundings. My mind was on the car, the drive back, and the hotel room that awaited me in Oakland, walking distance from the In-N-Out Burger. I made sure when I booked the trip that I had at least one hotel night, so I could sleep in a real bed and have an actual shower before the flight home. Mister Father-of-Three told me the night before that he and his family planned to drive straight to the airport after five nights on the trail. I don’t know if I feel worse for him, or the people near him on the plane. I was also hiking on two blackened toenails that I knew I’d probably lose. It wasn’t that I dropped anything on them, just the repetitive banging against the front of my boot. Any marathoner is likely familiar with black toenails, but they are something I try to avoid. Not only are they painful, they’re just ugly. My feet after a couple of days on the trail. The second and third toenails on my right foot are just turning black. Cut to Oakland, a few hours of driving later. I actually found the energy to go for a run around the Martin Luther King Regional Shoreline, where I saw birds and sea lions and, way off in the distance, the San Francisco skyline. I ended my run at In-N-Out, like you do, and set my tent up one last time, inside my hotel room, so it would have a chance to dry and not mildew. Then it was time for a shower and some beer before bed and an early morning flight. If you’ve read this far, I’m not sure what to leave you with. All I can say is that I’m eager to get back and explore more of Yosemite. My original plan would have taken me past Tenaya Lake and Yosemite Fall, the tallest waterfall in North America. I’m eager to get back and see what I missed. I can tell you that flying to Oakland and renting a car is a great way to get there and back–it’s a quick and easy four-hour drive from the airport to parking at Yosemite Valley. 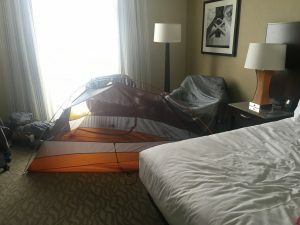 My final “campsite” was in my Oakland hotel room, where my tent could dry before I packed it away for a while. If you’re considering a trip, get your trailhead permit early, and consider going before the Half Dome cables go up. Yes, you might have to skip out on Half Dome, but during snowmelt season the rivers and falls are much more dramatic. Besides, Half Dome is much too crowded anyway. Take my advice and summit Clouds Rest, where you can literally look down on those suckers waiting in line. Oh, and I highly recommend that last night in a hotel before you fly home. A hotel bed never feels better than it does after a few nights on the rugged trail. Quick author’s note: I am an experienced backpacker, and do not advise anyone to try solo backpacking, especially in bear country or in snow, unless you have similar experience. I’d also like to point out that I opted not to carry my DSLR camera on this trip because of its weight, and so all these photos were taken with an iPhone 6s. That’s not a paid endorsement, but I have to give credit where it’s due.